This cartoon is on the front of the latest issue of The Jester, the Cartoonists' Club newsletter. 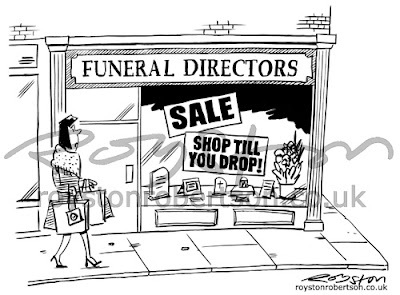 The theme was shopping and I was amazed, and amused, that the Ed picked this cheerful cartoon. Also in the issue is this photo from the recent club convention at Butlins. It's the obligatory "Cartoonists: we're a wacky bunch" pic. Yes, that's right, we're holding our cartoons upside down! Will the craziness never end?! These are the winners in the Great British Holiday cartoon competition. Pictured, left to right, are Pete Dredge, Rich Skipworth, me, and Tim Harries. 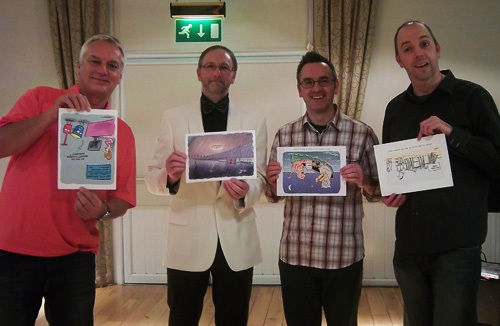 Rich, Tim and Pete won first, second and third, respectively, and I won the public vote (for this cartoon). Thanks to Steve Willis for the photo. Holding your cartoons the wrong way up! You guys!!! I know, what are we like?!! we are in fact glued to the ceiling and the cartoons are the right way up. Wacky, eh? If that's true, the figure on the fire-escape sign becomes a breakdancer.